Air Quality | Airmaker, Inc. Warm, dry air acts like a giant sponge, soaking up moisture from everything it touches. Low humidity causes dry skin, irritates throat and nasal passages, aggravates allergies and asthma and makes you more susceptible to illnesses. Replenish that moisture with a whole house humidifier. Featuring TRUE HEPA FILTRATION for filtering airborne allergens, these quiet, lightweight and portable air purifiers are ideal for those suffering from allergies, asthma, respiratory problems or environmental concerns. 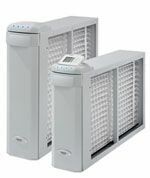 Air cleaners are medically approved for relief from dust mite allergen, animal dander, pollen, mold spores, bacteria, tobacco smoke, odors, germs and harmful fibers. Efficient at 99.97%, the HEPA Filtration System removes just about anything that could cause a problem, while the Odor Reducing Carbon Filter helps to control odors to ensure you’re breathing cleaner, fresher air. Bacteria and mold spores travel through the air in your home every time your heating and cooling system’s fan is in operation. A whole house purifier uses ultraviolet germicidal light to kill mold and bacteria before they re-circulate and affect your family’s health. Carbon monoxide is not visible and high levels in the home can be deadly. Just watch the news every winter. This unit is battery operated and has a sensor that isn’t activated until it is installed. Equipped with a red light that flashes every 60 seconds, you will be able to see that it is working all the time, helping to keep your family safe from CO2. We are available for prompt Air Quality testing and air quality equipment repair and installation throughout Cook County, DuPage County, Kane County, Lake County, and McHenry County Illinois. Suburbs we frequently service for Air Quality include: Addison, Algonquin, Bloomingdale, Carol Stream, Chicago, Elk Grove Village, Elmhurst, Geneva, Glen Ellyn, Lombard, Roselle, St. Charles, Waukegan, Wheaton, Woodstock, and many more wonderful communities throughout the Chicagoland area.